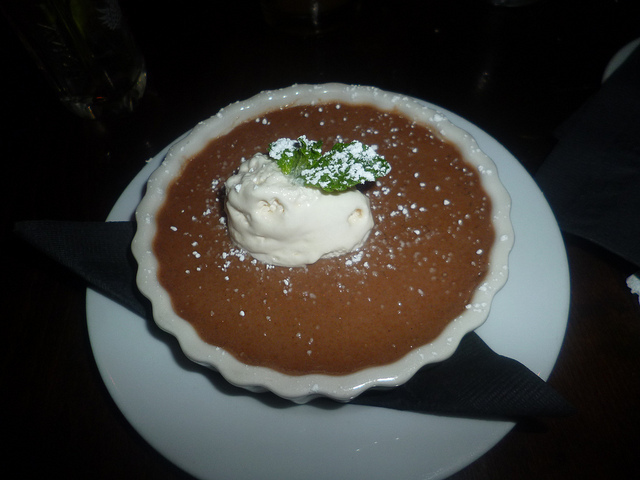 Forays of a Finance Foodie: Teqa Revisited: New Chef, New Cuisine! I was lucky enough to attend a dinner to meet Teqa’s new 28-year-old chef Steven Cruz (who was hired a few months ago after doing a long stint at the now defunct Orchard House on the Lower East Side and in private catering). Cruz started our dinner by announcing that the midtown eatery was changing over from traditional to modern Mexican. I was able to sample several dishes that were delightful, washed down with a Jalapeno Gratinee between the appetizers and entrees (talk about a thorough palate cleansing—what a “bang” it gave off)! The all-new menu has as many as many appetizers as entrees (about 15 of each), and I had to test out Chips & Dips which give you get three kinds of salsa and guac ($15) and loved the fresh baked lightly salted chips and special roasted tomato pico de gallo with the lovely tomato kick. 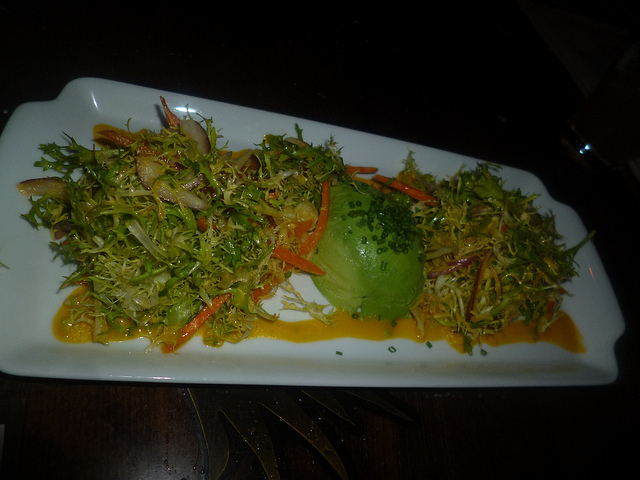 I ate a lovely Avocado Ensalada ($12) just to be a little healthy—it’s a lovely jumble of carrots, frisee, cucumber, hearts of palm, chives doused with cilantro lime vinaigrette. There’s also the hysterically named Tuna On Crack ($10), which is a tuna tartare made with sushi grade tuna and layered with avocado, cucumber, cilantro oil, sesame seeds, chipotle oil and homemade tortilla chips. But I fell head over heels with the Guava Chicken Wings ($10)—which are tender chicken drumettes grilled in a guava BBQ sauce with cilantro chimichurri sauce on the side as a dipping sauce. I ordered the Boneless Short Ribs ($25) as my entrée upon recommendation of Cruz—it’s his favorite dish. He gets into the restaurant at 10 AM to braise the ribs for seven hours. They are doused with Tamarind BBQ sauce and served over a bend of roasted corn puree and topped with cilantro oil. The tenderness of the ribs meat is world-class. The term “melt in your mouth” really applies here. 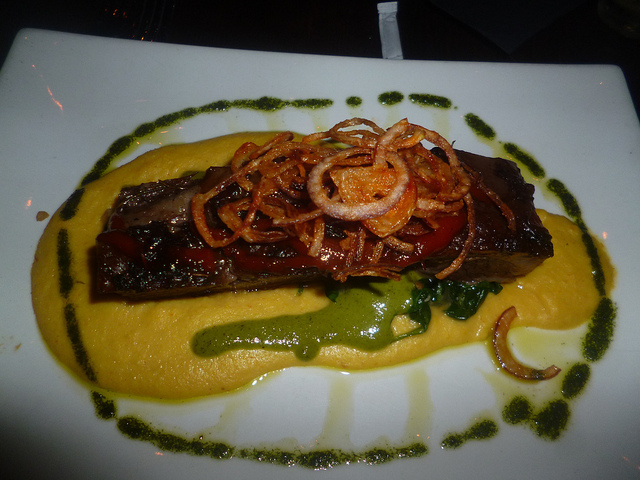 I sampled my friend Grilled Skirt Steak ($28) which is a large portion between 12 and 14 ounces. The steak is marinated in chipotle adobe for 14 hours then grilled and served with grilled scallions, crispy yucca sticks and chimichurri sauce. I had a lovely side of Mexican Style Grilled Corn ($6); I loved the coating of Cotija cheese, Chipotle oil and Sweet Paprika. I sampled a few desserts including the Churros ($6)—which were so hot and tender dusted with cinnamon sugar served with both dulce de leche and chocolate tequila sauces—and the new Crema De Chocolata ($8), a take on chocolate mousse which is smoother and sassier. It’s topped with luscious espresso whipped cream. Cruz admitted to my dining party of all press people/food bloggers that he puts tequila in all the desserts now, which the exception of the ice cream!